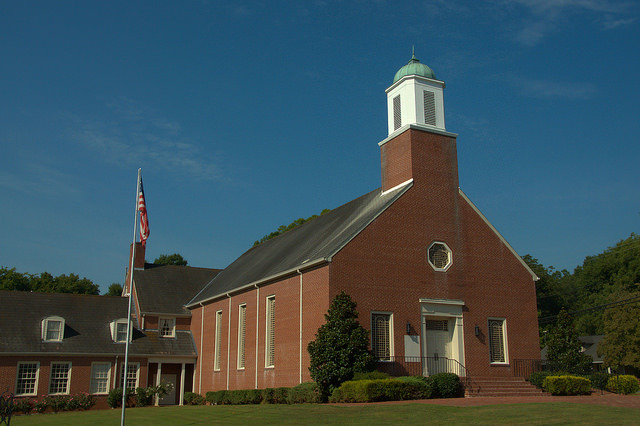 This historic congregation dates to 1848. Though the present building was constructed in 1937, it wasn’t dedicated until 11 January 1942. The pastor at that time was Madison D. Short, Sr. The cornerstone also lists others involved in the completion of the new church building. Building Committee: Dr. O. A. Selman, Chairman; R. A. Harlow; J. R. Jackson, Jr.; & N. S. Rich – Finance Committee: H. M. Woods, Chairman; R. A. Harlow; J. R. Jackson, Jr.; O. H. Perry; & T. H. Selman – Board of Deacons: W. P. Selman, Chairman; J. E. Baker; H. S. Burgner; Dennis Cox; O. P. Dawson; N. V. Dyer; A. J. Ellenburg; T. J. Espy, Jr.; R. A. Harlow; D. M. Hill; O. A. Selman; R. G. Smith; R. S. Thomas; R. N. Trimble; H. M. Woods – R. A. Harlow was Church Treasurer & W. G. Wheeler was Church Clerk.